The Good Cook (Stewart, Tabori & Chang, 2004) offers a comprehensive course for the home cook, outlining all of the essential techniques and including hundreds of accompanying recipes. 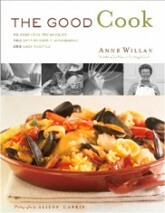 The Good Cook addresses every subject of importance to home cooks, including essential flavors and sauces; fish, meat and poultry; vegetables and eggs; pasta and pastry. Clear step-by-step photographs illustrate more than 70 basic techniques, which are followed by easy-to-execute recipes.